Atta Galata had recently published ‘Karnakavita’, a compilation of poetic works of 30 Hindi poets based in Bangalore. 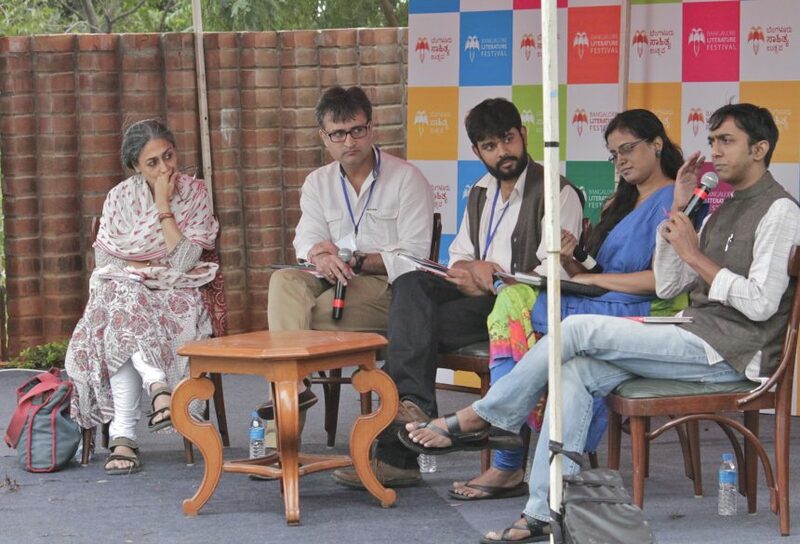 Five of them joined us in BLF 2015 to recite their poems and discuss the various cultural, artistic and lingual issues. The session was moderated by Sourav Roy. Agreeing to Padmavati, Devas Gupta laid stress on dialect and how it defines self-identity. He said, “It is important to write in the language in which you think.” On being asked about the collaboration of different art forms, Gupta stated that he is very open to the idea because it diversifies the way you think and at the same time makes it simpler for a person to understand and interpret a particular piece of art. Moreover, it brings people closer to the nuances. Lovely Goswami talked about the relevance of poetry and believed that as a poet, she feels a poem should be thought-provoking and hard-hitting. It should always mirror the discrepancies of a social system. Adding to the discussion on collaboration of art-forms, she said, Bharatnatyam involves dramatisation and Kathak involves story. Mohit Kataria shared his experience getting involved in the publishing of “Karnakavita.” “When we started off, I did not consider it more than a magazine. But, later on, my thinking widened when I realised that it is a compilation of 30 poets who live in Bangalore for livelihood and are not native to this city. This goes on to show how your language always keeps you rooted”, said Mohit. He differed slightly with Lovely on her views about relevance of poems as he felt that some thought always has to be there behind a poetic piece, but it ought not to be always hard-hitting or revolutionary in terms of socio-political issues. There is always a room for imagination. Mohit recited his poem ‘Guchche Nazmon Ke’. The session didn’t only add lyrical elements to the festival, but also reconsolidated the importance of Hindi, which seems to have been less promulgated as a medium of artistic manifestation.